Cheap travel. Cheap international travel lets in Islamic terrorist tourists/students/visitors (as in 9/11). Jihadis found it hard to travel to the West before the 1960s. Muslim immigration. Immigration of Muslims to the West lets in Islamic terrorist immigrants/refugees (as in 7/7). Even if the immigrants are alright, their children may become radicals. There were basically no jihadi citizens living in the West before the 1960s. Now there are, and there will always be. As I say elsewhere, not all immigrants (or visitors) are a threat. Most Muslim immigrants come to the West because they have some (sometimes confused) admiration for western ways and want to escape from sharia and jihad states to a better life. Only a small percentage of Muslim immigrants are violent threats to the West. But it is a steady small percentage, and it will never end. It is hard to see how attacks on the West by Islamic immigrants will ever end. The following is a list of Islamic terror attacks on the West since the start in 1968. Many countries - Palestinian terror 1968 on. USA - RFK assassination 1968. Italy - El Al Flight 426 1968. Greece - El Al Flight 253 1968. Switzerland - El Al Flight 432 1969. UK - Marks and Spencer 1969. Italy - TWA Flight 840 1969. UK - Zim shipping 1969. Belgium - El Al, Brussels 1969. Greece - El Al, Athens 1969. Germany - Munich airport 1970. Switzerland - Swissair Flight 330 1970. Various countries - Dawson's Field hijackings 1970. Austria - Sabena Flight 571 1972. Germany - Munich Olympics 1972. UK - Israeli embassy 1972. USA - letter bomb 1972. USA - Hamaas Khaalis 1973. USA - Stephen Gilroy 1973. USA - Yosef Alon 1973. Greece - El Al, Athens 1973. Holland - Japan Air Lines Flight 404 1973. Greece - Athens airport 1973. Austria - train hostages 1973. Italy - Pan Am Flight 110 1973. UK - Teddy Sieff 1973. USA - Zebra killings 1973-74. UK - London bank 1974. Greece - TWA Flight 841 1974. France - Paris airport 1975. Austria - OPEC siege 1975. Greece - Entebbe hijacking 1976. USA - Hanafi Siege 1977. Spain - Lufthansa Flight 181 1977. Various countries - poisoned oranges 1978. France - Paris airport 1978. Many countries - Iranian terror 1979 on. France - Paris bombs 1979. Belgium - Brussels airport 1979. Austria - Vienna synagogue 1979. Spain - Max Mazin 1980. UK - Mohamed Mustafa Ramadan 1980. Belgium - Yosef Halachi 1980. France - Paris synagogue 1980. Italy - Rome airport 1981. Austria - Heinz Nittel 1981. Italy - El Al office 1981. Greece - travel agency 1981. Austria - Israeli embassy 1981. Austria - Vienna synagogue 1981. Belgium - Antwerp synagogue 1981. France - Christian Chapman 1981. Germany - Berlin restaurant 1982. France - Charles Ray 1982. Italy - El Al office 1982. France - Paris-Toulouse train 1982. France - Israeli embassy 1982. Austria - French embassy 1982. UK - Israeli ambassador 1982. France - Paris restaurant 1982. Japan - Pan Am Flight 830 1982. Belgium - Brussels synagogue 1982. Italy - Rome synagogue 1982. USA - Daniel Jordan 1982. Australia - Sydney bombs 1982. USA - Hotel Rajneesh bombing 1983. USA - Ahmadi attacks 1983. France - Paris restaurant 1983. France - TGV bombing 1983. Greece - Kenneth Whitty 1984. UK - Yvonne Fletcher 1984. France - Marks and Spencer 1985. France - Jewish film festival 1985. Greece - TWA Flight 847 1985. Germany - Frankfurt Airport 1985. Denmark - Copenhagen synagogue 1985. Germany - Rhein-Main Air Base 1985. Greece - hotel attack 1985. Argentina - Jewish kindergarten 1985. Greece - EgyptAir Flight 648 1985. Italy and Austria - Rome and Vienna 1985. France - Paris bombings 1986. France - TGV bombing 1986. France - Paris bombing 1986. Italy - TWA Flight 840 1986. Germany - West Berlin 1986. UK - BA office 1986. France - Kenneth Marston 1986. Germany - U.S. Tempelhof Air Base 1986. Belgium - Antwerp synagogue 1986. Switzerland - Air Afrique hijack 1987. Italy - poisoned grapefruit 1988. Greece - City of Poros 1988. Many countries - Salman Rushdie 1989 on. USA - Rushdie bookshops 1989. USA - Riverdale Press 1989. Italy - Rushdie bookshops 1989. Belgium - Rushdie killings 1989. UK - Rushdie bookshops 1989. Norway - Rushdie bookshops 1989. France - Rushdie publisher 1989. Belgium - Joseph Wybran 1989. USA - Rashad Khalifa 1990. Switzerland - Kazem Radjavi 1990. USA - Meir Kahane 1990. Australia - Makin Morcos 1991. Italy - Ettore Capriolo 1991. Japan - Hitoshi Igarashi 1991. Argentina - Israeli embassy 1992. USA - CIA HQ 1993. Norway - William Nygaard 1993. Argentina - Jewish centre 1994. UK - Israeli Embassy 1994. France - Algerian terror 1994-95. France - Paris Metro 1995. France - Jewish school 1995. France - Paris train 1996. France - Paris metro 1996. USA - Empire State Building 1997. South Africa - Planet Hollywood 1998. USA - EgyptAir Flight 990 1999. USA - H. Rap Brown 2000. Germany - Dusseldorf synagogue 2000. France - Villepinte synagogue 2000. UK - Nabil Ouldeddine 2000. France - AZF explosion 2001. USA - shoe bomber 2001. Holland - Pim Fortuyn 2002. USA - Beltway sniper 2002. France - Bertrand Delano� 2002. UK - Stephen Oake 2003. USA - Ariel Sellouk 2003. France - Sebastian Sellam 2003. Holland - Theo van Gogh 2004. France - Ilan Halimi 2006. USA - NC SUV attack 2006. Germany - Amir Cheema 2006. Holland - Almere beheading 2006. USA - Seattle Jewish centre 2006. USA - CA SUV attack 2006. Norway - Oslo synagogue 2006. UK - London and Glasgow 2007. USA - Chauncey Bailey 2007. UK - Sherry Jones 2008. USA - Little Rock 2009. USA - Fort Hood 2009. USA - Richard T. Antoun 2009. USA - Flight 253 2009. Denmark - Kurt Westergaard 2010. USA - Times Square 2010. UK - Stephen Timms 2010. Sweden - Lars Vilks 2010. Sweden - Malmo synagogue 2010. Denmark - Copenhagen hotel 2010. Sweden - Issa Issa 2010. USA - military shootings 2010. USA/UK - cargo planes 2010. Italy - Nello Rega 2011. UK - Gary Smith 2011. Brazil - school shooting 2011. Canada - Paris Dipersico 2011. USA - Waltham murders 2011. USA - Alaa Alsaegh 2011. Germany - J. Gehirn 2011. France - Charlie Hebdo arson 2011. Denmark - Hare Krishna temple 2011. Germany - Ferhad Ahma 2011. South Africa - Al-Shabaab terror 2011-12. USA - Gelareh Bagherzadeh 2012. Norway - Christian converts 2012. Australia - Alevi centre 2012. France - Toulouse massacre 2012. Bulgaria - Burgas bombing 2012. Cyprus - British soldier 2012. USA - Coty Beavers 2012. Denmark - Lars Hedegaard 2013. France - post office hostages 2013. USA - Boston Marathon 2013. UK - Woolwich soldier 2013. France - Paris soldier 2013. UK - prison officer 2013. USA - Gay nightclub fire 2013. Belgium - Jewish Museum 2014. France - Jewish supermarket 2014. USA - Ali Muhammad Brown 2014. UK - Edmonton, London beheading 2014. USA - Oklahoma beheading 2014. Denmark - Kvissel murder 2014. Canada - Ottawa Parliament attack 2014. USA - New York axe attack 2014. UK - Israel stall 2014. France - Jewish restaurant 2014. Australia - Sydney cafe 2014. USA - John Bailey Clark 2014. France - Charlie Hebdo 2015. Germany - Cartoons arson 2015. Denmark - Copenhagen cafe 2015. Denmark - Copenhagen synagogue 2015. USA - Terrence Lavaron Thomas 2015. Austria - Vienna murder 2015. South Africa - Zainub Priya Dala 2015. France - Aurelie Chatelain 2015. USA - Muhammed cartoon contest 2015. Austria - Graz SUV attack 2015. France - Factory beheading 2015. France - train attack 2015. Denmark - asylum seeker 2015. USA - University of California 2015. France - Paris massacre 2015. USA - San Bernardino massacre 2015. UK - Leytonstone tube 2015. France - soldiers at mosque 2016. France - Paris police station 2016. USA - Ohio restaurant 2016. Germany - Hanover stabbing 2016. Canada - Toronto stabbing 2016. Belgium - Brussels bombings 2016. UK - Asad Shah 2016. Germany - Essen bombing 2016. Germany - Grafing stabbing 2016. UK - London supermarket 2016. USA - gay nightclub massacre 2016. France - Policeman and family 2016. France - Nice truck massacre 2016. Germany - train axe attack 2016. France - stabbing of children 2016. UK - RAF base attack 2016. Germany - Ansbach suicide bombing 2016. France - Normandy church attack 2016. UK - Russell Square 2016. Canada - Aaron Driver 2016. USA - Roanoke stabbing 2016. Germany - Oberhausen stabbing 2016. France - Toulouse stabbing 2016. France - Ghislain Gilberti 2016. Holland - Gay stabbing 2016. USA - Minnesota mall 2016. USA - NY and NJ bombings 2016. Belgium - Brussels stabbing 2016. Switzerland - extremist mosque 2016. USA - Ohio State attack 2016. Germany - Berlin truck attack 2016. Austria - refugee attack 2016. USA - Denver guard 2017. France - Louvre attack 2017. France - Jew tortured 2017. Germany - D�sseldorf attacks 2017. France - Orly airport 2017. USA - Saudi student 2017. Holland - gay attack 2017. France - Jewish woman 2017. Sweden - Stockholm truck attack 2017. USA - Fresno killings 2017. Germany - apostate killed 2017. France - Yvelines shootings 2017. Iceland - Robert Spencer attack 2017. Italy - Milan stabbing 2017. USA - Devon Arthurs 2017. UK - Ariana Grande concert 2017. Germany - Ramadan killing 2017. UK - London Bridge 2017. France - Notre Dame 2017. Belgium - Brussels station 2017. USA - Michigan airport 2017. Germany - Mohammad Hussain Rashwani 2017. Germany - Hamburg supermarket 2017. Germany - Leipzig stabbing 2017. France - attack on soldiers 2017. Belgium - attack on soldiers 2017. UK - Buckingham Palace 2017. UK - tube bombing 2017. France - hammer attack 2017. France - Marseille station 2017. USA - NYC truck attack 2017. USA - Minnesota mall 2017. Sweden - Gothenburg synagogue 2017. USA - NYC subway attack 2017. Australia - Melbourne car attack 2017. Germany - Berlin knife attack 2018. Australia - Melbourne stabbing 2018. Austria - Vienna knife attack 2018. USA - Corey Johnson 2018. USA - Travis Air Force Base 2018. France - Trebes supermarket 2018. France - Mirelle Kanol 2018. Holland - The Hague 2018. France - Paris knife attack 2018. Belgium - Liege attack 2018. France - supermarket stabbing 2018. Germany - Lubeck stabbing 2018. Canada - Toronto shooting 2018. UK - Westminster car attack 2018. Holland - American tourists 2018. Spain - German tourists 2018. UK - Barnsley stabbing 2018. France - Paris stabbing 2018. Germany - Ravensburg stabbing 2018. Austria - train attack 2018. Germany - Cologne station 2018. Australia - Melbourne attack 2018. Belgium - Brussels stabbing 2018. France - John Dowling 2018. France - Strasbourg massacre 2018. UK - Manchester stabbing 2018. France - Marseille stabbing 2019. I exclude Islamic attacks on the democracies of Israel and India. These states have very different histories with Islam to the main Western countries. I exclude Islamic attacks on Russia, which is not a democracy and not part of the West. I mostly exclude attacks by Muslims on Muslims inside the West. e.g. Palestinian attacks on other Arabs, such as Naji al-Ali, or attacks on Muslim embassies, such as the Iranian Embassy Siege, or Sunni-Shia sectarian attacks. The idea of excluding them would be that such attacks do not threaten Westerners. But maybe I should include them. I include any attack on a Muslim for defending liberal values. I exclude the vast number of failed plots. I only include attacks that were actually carried out in some form. I exclude many minor attacks. I exclude Islamic attacks on Western bases, people, embassies, etc., if those attacks take place outside the West. Or hijacks that started outside the West. I exclude the large number of honour killings that have taken place in the West. I exclude all Islamic domestic violence. Honour killings might actually be the main form of Islamic violence in the West (by numbers of people killed). I exclude the ocean of Islamic violence outside the West, that has killed millions in the above time period. See Summary of modern killings for Islam. In other words, Islam is much more violent than it appears even in the list above. Lists of attacks in the West here and here. Study of Islamic terror attacks on the West, Jan 2012 to June 2016. If you can think of any more attacks that should be on this list, let me know. Daily Caller link to here, 23 Mar 2012 (after Toulouse) from Adam Turner. I note that Islamic terror against the US began in 1785 with Islamic piracy. The envoy of the Barbary pirates explains why Islam allows them carry out raids on the infidels. The above is from a 1786 letter reporting a meeting between Thomas Jefferson, U.S. ambassador to France, and Sidi Haji Abdul Rahman Adja, the Tripoli (Barbary pirate) envoy to London. From p.342 of vol.2 of The Diplomatic Correspondence of the United States of America, published 1837. Hat tip to Ali A. Rizvi. The first day of the war: 5 June 1968. 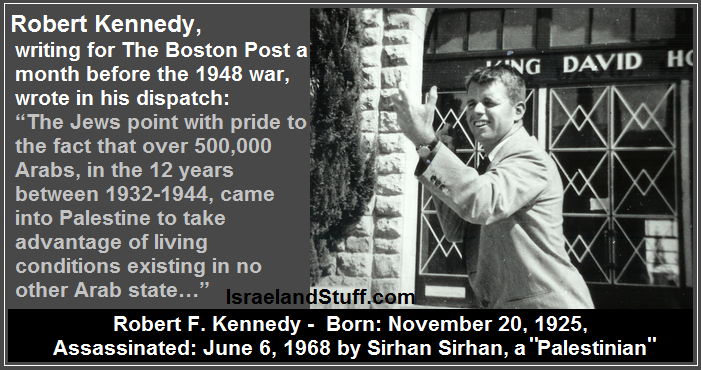 The assassination of RFK was carried out by a Palestinian Christian, but he was working for the jihad (like many other idiot Arab Christians). Clip from TV movie RFK (2002). In the brilliant Message from a Time Traveler, the Time Traveler comes from the future to warn of "The Century War". In retrospect, he says, we can see when it started: "I mean the Century War with Islam. Your future. Everyone's. ... I mean the Long War with Islam. The Century War. And it's not over yet where I come from. Not close to being over. ... Historians in my time know that it began on June 5, 1968. But it hasn't really begun for you yet. For any of you." RFK, the first victim of the modern jihad. The Munich Massacre in 1972. The modern day Jew-hating Nazis kill Jews in Germany. Clip from the movie Munich. The scumbag Leader of the Opposition in Britain attended a memorial service for these killers. German terrorists help Islamic terrorists kill Jews. This is the emergency call of Kevin Cosgrove. Islamic attacks on the West will never end. There have not (yet) been any Islamic terror attacks in Ireland. But Islamic terrorists have been attacking and killing Irish people abroad (in the West and outside the West) for many years. Aidan Walsh kidnapped by jihadis in Lebanon, 1985. Brian Keenan held hostage by Islamist Hizbollah, 1986 to 1990. The Hindawi affair 1986. Jihadi uses his pregnant Irish girlfriend to try to blow up a plane. 3 Irish killed in Lockerbie bombing 1988. Valerie Place killed by jihadis in Somalia, 1993. Fr Des Hartford kidnapped by jihadis in Philippines, 1997. Noel Rooney targeted by jihadi bombers in Saudi Arabia, 2001. Fr. Rufus Halley killed by jihadis in Philippines, 2001. 6 Irish nationals killed by jihadis in 9/11 attacks, 2001, and hundreds of Irish-Americans. Those murdered included Irish-born Ruth McCourt and her daughter Juliana McCourt, age 4. Aidan Leahy kidnapped by jihadis in Iran, 2003. Simon Cumbers killed by jihadis in Saudi Arabia, 2004. Irish aid worker kidnapped by Palestinian jihadis, 2004. Tony Higgins killed by jihadis in Saudi Arabia, 2004. Ken Bigley killed on video by jihadis in Iraq, 2004. Margaret Hassan killed on video by jihadis in Iraq, 2004. Ciaran Cassidy and Shelley Marie Mather killed by jihadis in London bombings, 2005. Rory Carroll kidnapped by jihadis in Iraq, 2005. John Ging attacked by jihadis in Gaza in 2007, and threatened with death by them in 2010. Fred Parle kidnapped by Somali pirates, 2008. Sharon Commins kidnapped by (probably government-backed) Janjaweed in Sudan, 2009. Fr. Michael Sinnott kidnapped by jihadis in Philippines, 2009. David Bloomer held briefly by Iran, 2009. Helen Johnston kidnapped by jihadis in Afghanistan, 2012. Stephen McFaul held hostage by jihadis in Algerian hostage crisis, 2013. Tunisia tourists beach massacre, June 2015. Three Irish shot dead: Lorna Carty, Laurence Hayes and his wife Martina Hayes. Irishman David Nolan shot and injured in the Paris massacre 2015. Irish family injured in Istanbul bombing 2016. An Irish person was injured in the Westminster attack in 2017. Irish father and boy injured in Barcelona attack in 2017. Irish woman injured in Melbourne attack in 2017. Irish lecturer John Dowling was murdered in Paris in Dec 2018 by a Pakistani student who claimed he "insulted the Prophet Mohammed". The above list does not include Irish UN peacekeepers, or Irish soldiers in the UK or US military. If you can think of any more, let me know. People scratch their heads about the cause of "Islamophobia". Are westerners just hostile to "difference"? I suggest the main cause of "Islamophobia" is the never-ending series of Islamic terror attacks. "KSM explained that large-scale attacks such as 9/11 were �nice, but not necessary� and that a series of �low-tech attacks could bring down America the same way �enough disease-infected fleas can fell an elephant.��"